Roadside historical markers reveal much about what happened in the past. We see these signs and drive on by oblivious to the events that unfolded on the very ground we trod. 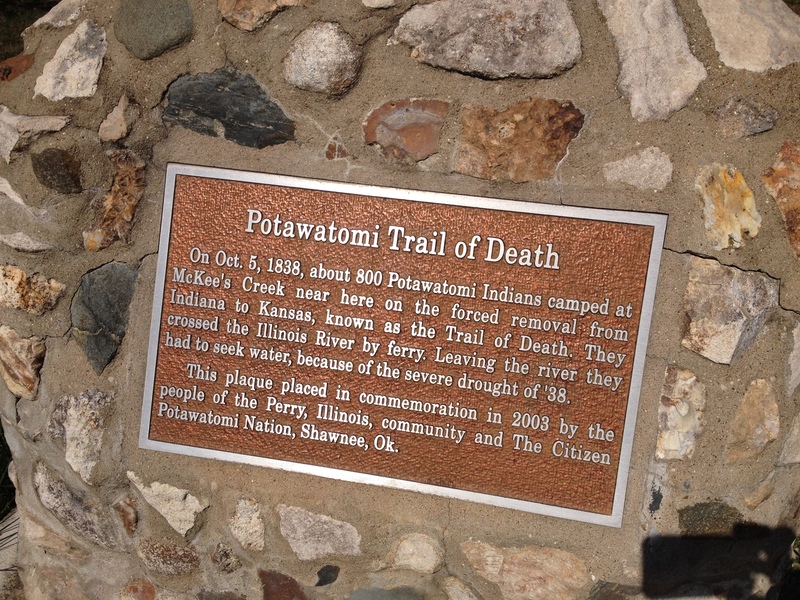 On a recent glorious trip to view the Fall Colors on the Pike Color Drive, we pulled over for one of these markers and found it was a marker for the Potawatomi Trail of Death. Much of this history was documented by Father Benjamin Petit who traveled with the Indians and soldiers. The story of this forced removal has been documented in an official trail and today markers like the one we saw commemorates the Trail of Death. Credit for this feat started on the 150th anniversary in 1988 when a group of historians and Potawatomi ancestors began to commemorate the event. They formed the Potawatomi Trail of Death organization and contacted all 26 counties n the four states where the trail took place. Through their efforts they were able to gett the Trail of Death declared a Regional Historic Trail. Since 2003 markers have been placed at each camp site every 15 to 20 miles. The marker we saw along the Fall Color Drive was just one of the places where the group stopped in Illinois. So much has happened, both good and bad along our roadways. It is always eye opening to stop and take a look and learn who traversed the highways before us.